What insights does researcher get from running Eye Tracking test and survey separately? Survey shows if advertisement works or if it does not work. Eye Tracking merely illustrates finding from the survey, more often than not using only materials or elements that were successful, recognizable. Which of the visual elements make this advertisement successful and which elements make it unsuccessful. The combined data from Eye Tracking and traditional survey allow the researcher to draw conclusions that are more accurate. The researcher does not just reject ineffective advertisement but gives valuable feedback on how to make it effective by getting more precise diagnostics and insights from a combined data. Integration of Eye Tracking into the survey engine was not possible until now. It is indeed a challenging task technology-wise. However, this fall CoolTool has combined two data collection methods within one platform. 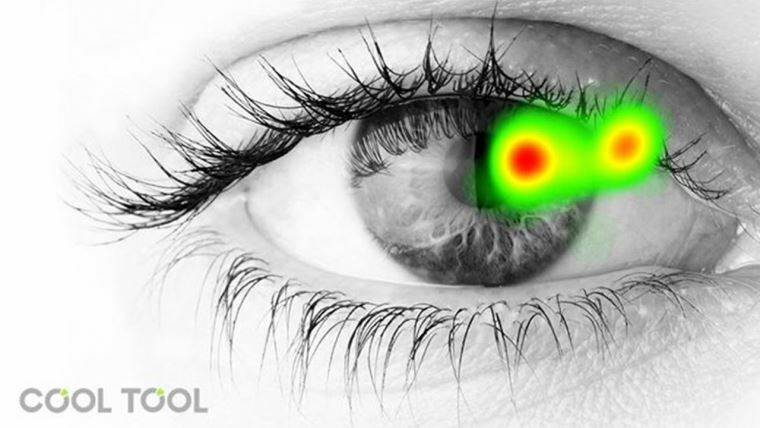 Eye Tracking has been integrated into CoolTool survey engine. Professional questionnaire for the product, advertisement, and website testing allows using 18 different types of questions with advanced logic. Now it also includes Eye Tracking testing. The interviewer does not need to switch between two separate software to run both tests, all data is collected with 1 questionnaire open in 1 browser window. Data analysis is not any more difficult than cross-tab analysis, where one of the two measurements is Eye Tracking statistics. An example of such statistics is the area of interest. It shows the number of customers that looked at the selected object, number of gazes/times customer looked at the selected object and overall duration of customer’s gaze fixated on the selected object. Statistical significance highlighted automatically. Data visualized through gaze plots, heat maps and opacity maps. Finally, results exported to fully editable PowerPoint or Excel with one click. Thanks to the integrated Eye Tracking researcher can tell if what customers say they see is what they actually see. Eye Tracking is considered costly to implement and time-consuming to set up. It is true when data from Eye Tracking test collected separately from the data gathered by a traditional survey. However, Eye Tracking integrated into the survey engine saves time and resources spent on one Eye Tracking project through data being collected, stored and analyzed within one cloud-based platform. Lately, technology became an important part of market research development. Eye Tracking being one of such technologies ultimately changed the way we conduct research. It has challenged the traditional survey methodology by bringing so much needed a biometrical approach in a product, advertisement, and website testing. Now researchers can get better insights with cost and time-saving Eye Tracking solution integrated into the survey engine. Too Long And Too Boring Questionnaires, What To Do With Them?